Blackburn have sacked manager Paul Ince after less than six months in charge with the club second-bottom of the Premier League. 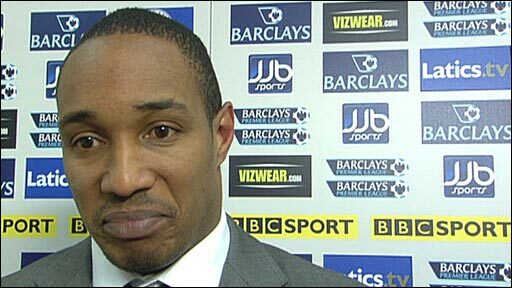 Ince, 41, joined Rovers from MK Dons in June but Blackburn's last league win was at Newcastle on 27 September. Chairman John Williams said: "Three wins in 17 games has seen a squad which finished seventh last season fall to 19th place. "We are currently in danger of becoming detached from the pack." The decision to sack Ince was taken after a Blackburn board meeting and Williams made it clear that the need to keep the club in the top flight was behind the move. Williams said the club intends to appoint a new manager in time for Saturday's match against Stoke, with former boss Graeme Souness an early front-runner, possibly assisted by veteran Blackburn midfielder Tugay. The former Bolton and Newcastle manager Sam Allardyce, who was considered for the post in the summer before Ince got the job, and ex-Charlton and West Ham boss Alan Curbishley have also been linked. Williams was publicly critical of Blackburn's display in what proved to be Ince's final game, the 3-0 defeat at Wigan on Saturday. He added: "The survival of the club in the Premier League is paramount and our focus is on finding a replacement who will be able to maintain our top-division status. "Paul will bounce back, he is a fighter and we wish him well." 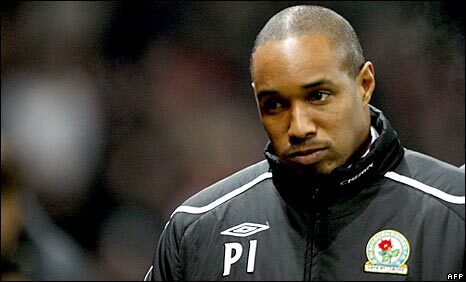 A statement released on the Blackburn website said: "The board, having selected Paul Ince back in June, were desperate for him to succeed and wanted to give him as much time as possible in the unforgiving environment of the Premier League, where time is such a precious commodity." The Blackburn squad returned to training on Tuesday after their Christmas party in Dublin and they were put through their paces by assistant manager Ray Mathias while Ince met with the board. Mathias, first-team coach Archie Knox and assistant first-team coach Karl Robinson will take charge against Stoke, although Chairman Williams said the club hoped to appoint someone before the weekend but added there were "no guarantees". Ince was appointed on 22 June on a three-year contract after spells with Macclesfield, who he helped avoid relegation from the Football League, and MK Dons, who he led to the League Two title and the Johnstone's Paint Trophy in his first season in charge. Despite Rovers' promising start to the campaign, the former Manchester United and England midfielder saw performances and results begin to deteriorate. Rovers have lost their last six league games and there have been reports of dressing-room unrest. But Mathias insisted that there was no unrest at Blackburn and that had no part to play in Ince's departure. "It is a load of rubbish. There is no happier a dressing room than ours - you would go a long way to beat that," he said. "It is a massive disappointment Paul has gone. Everyone is feeling it; the players, you can see it in their eyes. He added: "At the end of the day we are professional enough. Unfortunately the decision on the gaffer has been made, and we have to go along with what the club has said. "It is a small number of games for any person to be judged on, but we have to get on with our job now." Following the defeat at Wigan, Williams told the Lancashire Telegraph: "After all the signs coming out of Brockhall (Blackburn's training ground) this week, I was led to believe we would get a top performance. "Without taking anything away from Wigan I have to say I was very disappointed with what I saw. "The worry is the league table is beginning to stretch out and now we need two wins just to get back among the pack at the bottom." Blackburn's part-time defensive coach Nigel Winterburn felt Ince should have been given more time to prove himself at Ewood Park. "I'm not surprised with all the pressure Paul has been under or been put under with the results that he has been sacked," Winterburn told BBC Sport. "He knows and I know in the Premiership it is a cut throat world and it is a results driven industry that is run by fear. "I would have loved for him to be given time in the transfer window in January to bring in his own players. "I'm positive that he would have seen results improve but the board have decided that isn't the case. "I think people were starting to panic. The results have not picked up and they've decided they need someone else in place to drive the club forward." Winterburn though believes that Ince would soon be back in the game despite his departure from Blackburn Rovers. He said: "I think Paul has done really well and he'll be back in the game very quickly. "He did well at Macclesfield and also MK Dons and I'm sure there will be several clubs looking at him already." Former Blackburn striker Kevin Gallacher told BBC Radio 5 Live that the club is desperate to avoid relegation and the resultant loss of income. "I thought he would get a little bit more time, maybe to get into the transfer market, spend a bit of money and see how it went," said Gallacher. "But having seen the chairman's face on the TV at the weekend that told a massive story. "The club have a trust fund and they have been trying to sell the club. If the club go down that's a lot of money lost and the valuation of the club goes down as well. I think they've been possibly putting a lot of pressure on the board. "The board have been trying to back Paul as much as they could but the display at the weekend was the final straw - the pressure told and something had to give. Unfortunately it was Paul." Gallacher admits the club is not currently the most attractive proposition for an incoming manager. "Who's going to want to turn to the club now, sitting second bottom?" he added. "They're struggling a little bit, there's not a lot of finances there, there are quite a few injuries. "Steve McClaren was mentioned but he's doing very well in Holland (at FC Twente) and I've heard a small rumour about Roberto Mancini, there'll be a lot of names brandished about. "The CVs that were put in a cupboard six months ago when Paul got the job will be coming back out again." Blackburn's record scorer Simon Garner thinks the club have acted at the right time, and given his successor a chance to turn things around. Garner told BBC Radio Lancashire: "Results have gone badly and the board have acted quickly. "You have got to admire them for trying to get it sorted out and keep Blackburn in the Premier League. "It is a results business, especially in the Premier League. You have got to stay in that division. "The transfer window is coming up and you can see why they have done it. They want to get someone in place to say which players have got to go and which ones have to come in." Ince becomes the sixth Premier League manager to leave his post this season following the departures of Kevin Keegan (Newcastle), Alan Curbishley (West Ham), Juande Ramos (Tottenham), Harry Redknapp (Portsmouth) and his former Manchester United team-mate Roy Keane (Sunderland) on 4 December. Aston Villa manager Martin O'Neill believes that young managers are not being given long enough to prove they can do the job. O'Neill also felt that Ince should have been given time to build his own squad before being shown the door at Ewood Park. "It's getting harder and harder for young managers trying to make their mark," he told BBC Sport. "He's lost a couple of players immediately and has not had a chance to replace them and build his own side as I'm sure he would have hoped. "It seems like he's been in the job for only three minutes, which he has been, and it is exceptionally difficult. You are getting judged so quickly." "We are in the results business and we accept that point, but 17 games doesn't seem a lengthy period of time to be judged on."